The holiday season is here! Make sure you and your family stay safe with these helpful tips! 1. Set up an allergen free table - With so much excitement, it’s easy to mix up dishes and eat something that will make you sick, By making a special place for allergen free foods, you eliminate this risk. Ask guests dying to try your famous salad to get their allergen-free food first to avoid contamination. 2. When bringing your own food, make sure your utensils are clearly marked. It’s super easy to mix up the serving spoons and contaminate your whole dish. 3. Serve portions of the dish you prepared on individual plates for guests to take to avoid cross contamination with a serving spoon. 4. Eating at a family member’s home? - offer to help and educate them on how to avoid cross contamination in their kitchen. If they are resistant, you know you will need to bring alternatives. Have fun with it, Have a competition with your family which dish is better, allergen free of not? Show them you are not missing a thing while explaining the importance of keeping it safe. I have made many dishes where no one even thought they were eating allergen free!Have fun - by taking these precautions you can have a Safe & Sound holiday! 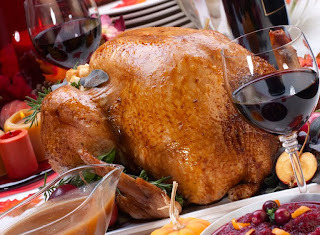 Try these recipes for your 2010 Thanksgiving dinner! Diagnosed with multiple food allergies and sensitivities at 38, I changed the direction of my lifestyle by researching and reworking the allergen-laden foods I had loved as a child, making them safe to eat and enjoy. My love of comforting, satisfying food began in my great-grandmother’s kitchen, who raised me, at the stove; where she made three calorie-rich but delicious meals from scratch everyday. Using my great grandmother’s collection of handwritten recipes, I modified and adapted many of the dishes I loved as child to fit into an allergy free lifestyle anyone can adopt. By sharing these recipes, I believes that leaving out the allergens doesn’t mean leaving out the fun. The content of the lisacooksallergenfree.com blog is for informational purposes only and is not a substitute for professional medical advice, diagnosis, or treatment. For medical advice, please contact your physician or other qualified healthcare professional.